Homepage. This page: A factory-produced magazine issued by Morris Motors Ltd, of Cowley, Oxford, England. Morris Owner, April 1938 car magazine. This rare magazine was found in a pile of junk at a car boot sale, perhaps the result of a house clearance? It was issued in April 1938, and was published on behalf of Morris Motors Ltd, and sold to anyone interested in their motorcars, price 4d. The condition isn't brilliant, with the cover tatty and loose from the rest of the mag. However the internal pages are good, so it was well worth rescuing. 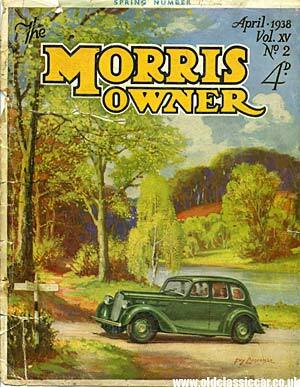 The cover shows a smart Morris saloon car, negotiating the leafy lanes of Britain, with the old style fingerpost road sign on the left. The artist was Guy Lipscombe. The first few pages are given over to some great old advertisements, all trying to sell the trilby-wearing, pipe-smoking, motor enthusiast all manner of useful gadgets and products. Advertisers include Brico (piston rings), AC quality spark plugs, Pyrene fire extinguishers, Speedwell Motor Oils, Morris Marine Engines, Connolly Leather (used in Morris cars), the Bluemels Telescopic steering wheel, Ferodo brake linings, and Morris' own range of lorries and vans, which were badged as Morris Commercial in those days. The advert shows a drawing of the Morris-Commercial Equi-Load, and a list of features including "Classic Frontal Appearance", "Real safe driving visibility", and "Light positive steering, good turning circle - so easy to manipulate that traffic and congested area bogies vanish" - how the written word has changed since 1938!! 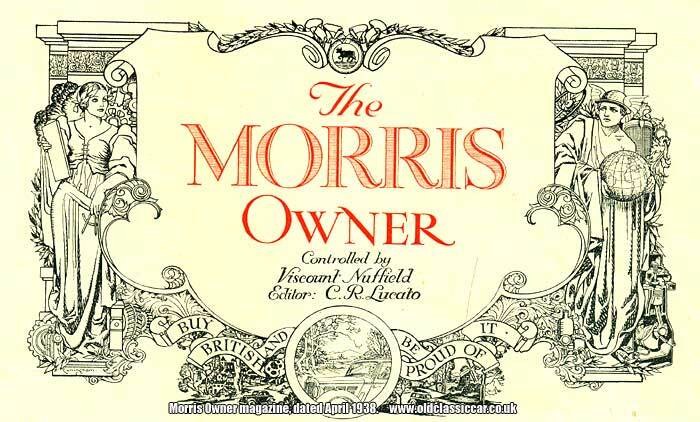 The proper content of the magazine starts with this wonderfully patriotic design, advising the reader that the Morris Owner magazine was controlled by Viscount Nuffield, and edited by C.R. Lucato. "Buy British And Be Proud Of It" was the slogan used by Morris Motors and shown here, sadly not something that could be applied to many products today. "Although unexcelled service facilities are provided nowadays, most Morris owners who take a pride in their car, be it a Series model or an old stager, like to go over the car themselves at the beginning of what used to be termed 'the season', cleaning and tuning up, in order to obtain the best performance in the favoured months of the year. It is not suggested - generally speaking - that an owner should undertake extensive overhauls, because they are better left to the garage with all the essential tools and equipment, but there is no reason why the average owner should not carry out ordinary maintenance attention successfully." 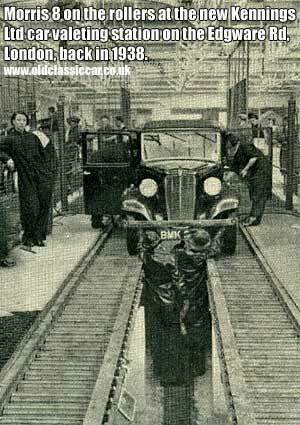 The heading images shows a suited chap blasting out mud from under the chassis of his Morris 10 car. Some articles are of a more general nature, and don't really relate to motoring too closely. For instance, news that the Cuckoo will be heard now that Spring had dawned, might be of interest to twitchers, but I think the earnest male motorist would probably flick quickly past this feature, and the next one, discussing motoring coats and attire for the female motorist, to find something altogether more manly. 8 minute car service and valeting at Kennings Ltd. The following article, discussing "The first eight-minute car valeting station for metropolitan motorists" would probably have been of more interest. Captain G.E.T. Eyston performed the opening ceremony, at this new facility on the Edgware Rd in London. Five hundred cars could be handled each day, with each car passing along a system of rollers while all its systems are checked over, and the cleaning of the vehicle attended to. I wonder what happened to this automated system? bombed out during WW2? or closed and knocked down, to be replaced with buildings of a different use? The operation, run by the Kennings company, meant a car could be washed and polished, greased, vacuum cleaned, and the underside sprayed with oil, in a short space of time, while the owner looked on from the snack bar. Wheel and steering alignment could also be handled during the procedure, and facility to retread worn tyres using the vulcanisation process. Mr George Kenning, at the opening, stated that on average 40lb of wet mud would be collected from the underside of each car, resulting in ten tons of mud being collected over the period of one week, assuming 500 cars per day (!) used the service. For the adventurous motorist, who wished to take his Morris automobile overseas on a continental trip, is an article written by a Capt. A. W. Phillips of the RAC, headed by a large 1930s Morris saloon shown being hoisted onto a ship. In fact the article is more about promoting the RAC and its services, as they could handle all the paperwork for shipping your car to the continent. "The Western Indian Automobile Association comes forward with proof that in the Madras Presidency, at any rate, speed is responsible for an infinitesimal minority of accidents, according to statistics just issued. Report shows that out of 483 accidents, 433 occurred at speeds under 30 miles an hour, while only 34 occurred at speeds over 30mph." Of course back then cars were much slower than today's offerings, so I wonder what the situation in that area is like today? sadly Morris Owner magazine won't be running a feature on today's situation. There are loads of other articles, some relate to motoring in fine Morris automobiles, and others, such as the one about how to choose a fine pair of binoculars, in no way at all. A few more fine advertisements feature, including, towards the back, a one-page detailing the then-current Morris motorcars and vans. I'm surprised that they didn't place this page much earlier in the magazine, but perhaps priorities were different then? cheapest complete car on sale in 1938 was the Series 2 Morris Eight two seater, which cost just 126 GBP ex works. Cheapest vehicle of all was the 5cwt van, finished in 'shop grey' and available for 120 GBP. The van could be finished in a colour of your choice for a further 3:10s. Most expensive Morris of all was the Twenty-Five-Six (Morris 25/6 Series 3) Special Coupe, with sliding head, that cost a whopping 345 GBP. Return to the car magazines section here. A few years later, this particular magazine would be subtly renamed to The Morris Owner & Nuffield Mail. A wartime copy of this publication, dating to September 1944, may be found on this page.